Just ahead of the Apple iPhone event on Wednesday Samsung PR punted a story to HEXUS, hoping for coverage which in effect would be a recap of August as an "incredible month of new product launches from Samsung". However, we'd already written about the Galaxy Note9, Galaxy Watch, and Galaxy Tab S4 with S Pen and DeX. So, good try, but not really news on the eve of the latest iPhone series unveiling. Today, Samsung has teased something rather intriguing. An invite has been published on the official Samsung news portal for an upcoming Galaxy Event. 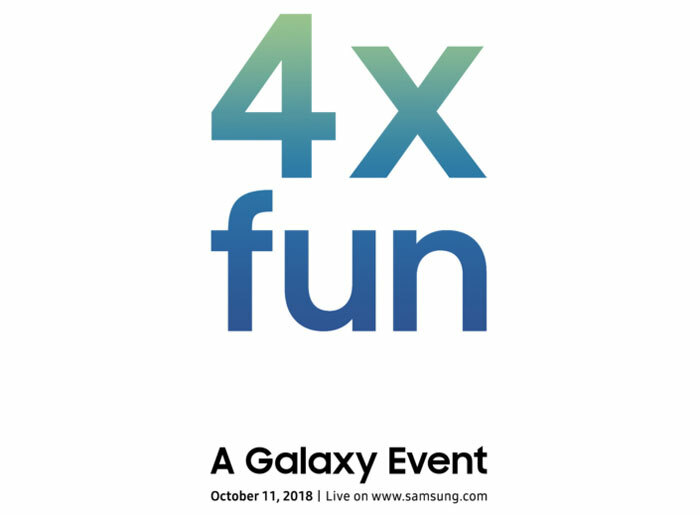 On Thursday 11th October, Samsung will reveal a new Galaxy device (singular) which offers '4x fun', headlines the invite graphic. We don't have much to go on in the news feature text but Samsung says that the "newest Galaxy device is bringing more ways to express yourself than ever before." Then we are asked to "capture the fun with Samsung" as the company celebrates the launch of the new device. From the phrasing it sounds like the fun has a lot to do with cameras and imaging. There are no new leaks about an upcoming Galaxy device from the usual suspects on Twitter but at the beginning of Setpember, Ice Universe (a Samsung leaker with some reputation) cryptically Tweeted the following: "Samsung Camera Camera Camera Camera". Answering a question that asked whether the statement indicated 2-front and 2-rear cameras, Ice Universe replied "all back". Later it was asserted that this quad-camera device will not be the Galaxy F or S10. With the launch a little under a month away I will be keeping my eyes peeled for photo and spec leaks for this device. I hope that at the October Galaxy Event we might also see some news on the Samsung foldable phone, after all it is "time to deliver" according to the mobile division's CEO. There won't be much time left for further Unpacked events before we hit 2019, so it may well be unveiled at the same time as the '4x fun' device. All i can think of is samsung and apple singing “everything you can do i can do better” and the other saying to the other “no you cant, yes i can” over and over. For me OIS is essential for a camera (my DSLR has it built into the sensor) as I shake like the proverbial dog and as I want to use my phone as a primary camera (for better or worse) that limits my choice. Add in the joys of demanding a 3.5mm jack and choice kinda goes out of the window. I think people forget that the well received HTC One M7 didn't have a high end SoC, but a mid range one which was well optimised. As ‘revolutionary’ developments stagnate, they're gradually refining the software as the engineers need to justify their jobs so their focus changes. Also there's only so much software can do on a phone and so as the lower end SoCs develop more sssspppppeeed it's just going to get better.